Located near the intersection of W Hillsborough Ave and Countryway Blvd, Extra Space Storage serves Tampa residents near Town 'N' Country, Westchase, Oldsmar, Citrus Park, Northwest Tampa, and more. Locals will recognize our facility near Dunkin' Donuts and Fifth Third Bank. With a wide range of storage units, climate-controlled storage, vehicle storage, and exceptional security, Extra Space Storage on W Hillsborough Ave is the solution for you in Tampa near Town 'N' Country! Our Tampa storage facility can accommodate residential and commercial storage needs with unit sizes as small as 25 square feet up to as large as 300+ square feet. We have the perfect storage unit for you! At Extra Space Storage in Tampa, we provide a safe storage environment by utilizing security features like electronic gate access, 24-hour video surveillance, and security access to your floor only. Worried about storing temperature-sensitive items? Store them with confidence at our W Hillsborough Ave storage facility! We offer climate-controlled units that stay between 55 and 80 degrees at all times. Looking for secure vehicle storage in Tampa? Extra Space Storage has outdoor parking spaces and enclosed drive-up units that can easily handle motorcycles, cars, boats, and RVs! With a secure, clean, well-maintained facility and a friendly, professional team, Extra Space Storage is the storage partner you can count on! We go above and beyond to deliver reliable self storage and exceptional customer service. 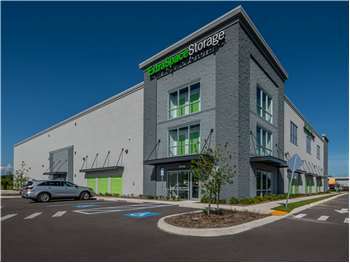 Contact us today to reserve a storage unit in Tampa!